On Thursday evening, May 12, the dining hall of St. Paul’s Parish on K Street was transformed into a musical comedic lounge reminiscent of a popular showroom at the Shoreham Hotel of an earlier era. 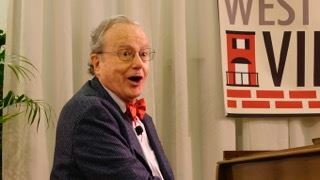 On that evening, the Foggy Bottom West End Village presented Mark Russell with his musical and political satire of the often absurd happenings in Washington and across our nation. Russell started in a piano bar on Capitol Hill before moving uptown to the Shoreham for over 20 years. His reputation is historical, but his material for the Village crowd was as current as the latest “breaking news” from cable TV. He played off today’s headlines, performing stand-up comedy while accompanying himself on the piano. More than 100 members of the Village and their friends from the local neighborhood laughed and, at times, sang along as Russell pointed out the folly of almost every current politician gracing the American scene.